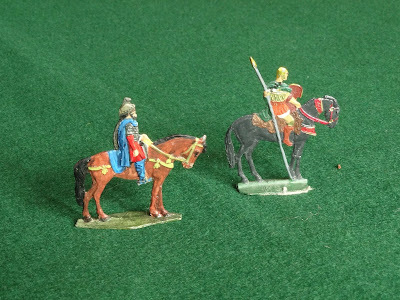 When I write 'The Battle of Trimsos', I somehow feel I should add © Donald Featherstone, or maybe ® Tony Bath. 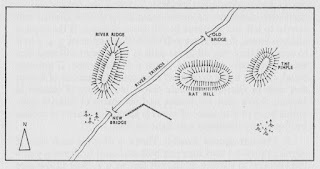 For me this is a trademark of early wargaming, and very much a classic encounter. 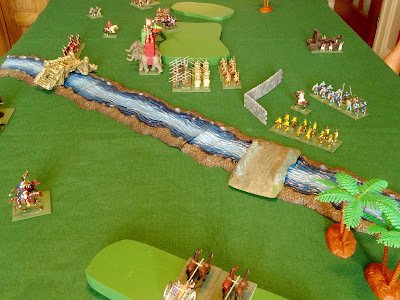 As Mr Featherstone's War Games (1962) was the first wargaming book I ever read, and Trimsos is the first battle described in that book, it follows that this was the first wargaming battle report I ever read. As such it holds a special place in my heart. So when Stuart revealed he had a collection of ancient figures and suggested a re-fight of the Battle of Trimsos, using the original rules, I answered 'yes' immediately. On arrival at Stuart's, he first showed me a couple of flats which he was given a while back, and which he believes belonged to Tony Bath. Quite something to have. 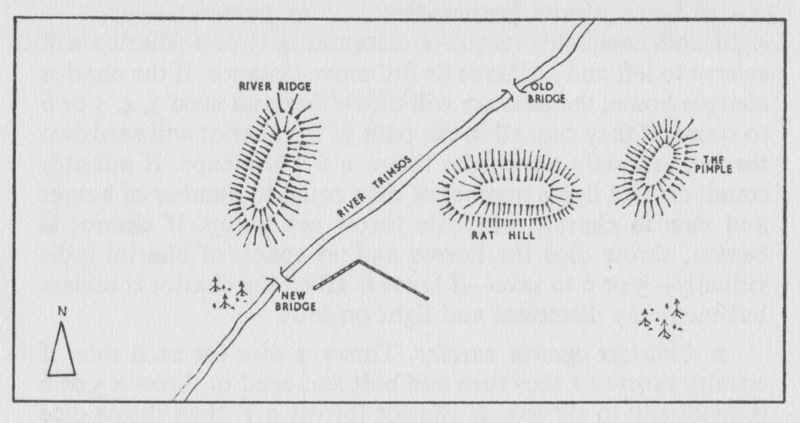 The map below, scanned from the book, shows the original battle setup. Stuart's dining table is 6' x 3', and so exactly matches the dimensions of the table as used in the book. And below we see how Stuart had set up the game. 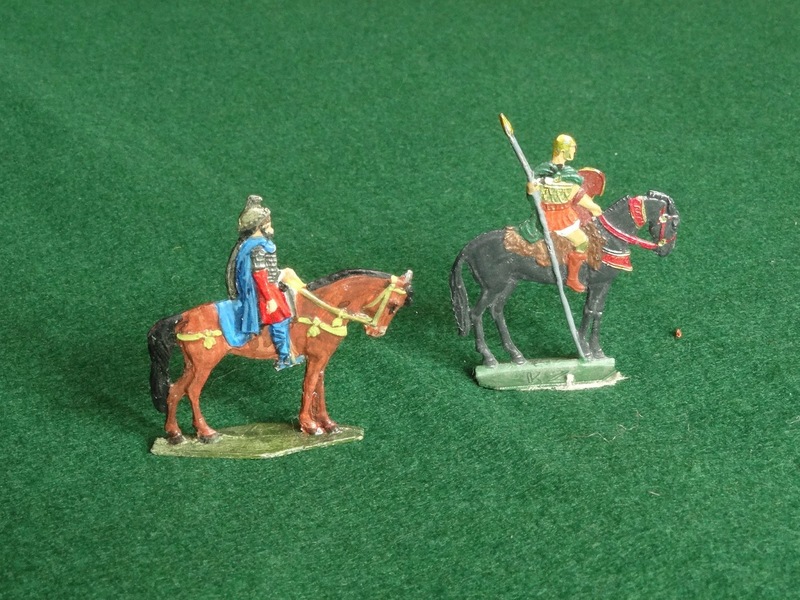 The figures are basically 20mm plastics, mainly Airfix and HaT, whilst the horse archers are Tradition 25mm and the generals are Hinchliffe figures. The river is from Pegasus Hobbies, with 'New Bridge' being a Bellona model and 'Old Bridge' a find in a garden centre, originally destined for a fish tank! The wall is a bit of Britain's terrain. 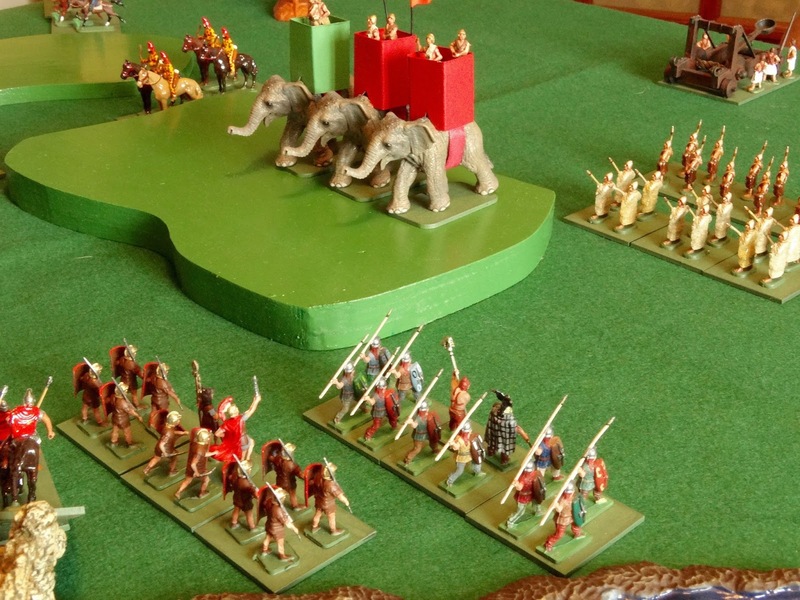 The elephants are adapted, in true Old School fashion, from Schleich 'baby elephant' models. The palm trees are from Poundland - another typical Stuart find. The hills are home-made MDF shapes. Roman legionaries co-operating with Ancient Britons in the foreground? Sacrilege! The 2nd Imperial Archers prepare to defend the New Bridge. General view of the action after 3 moves. 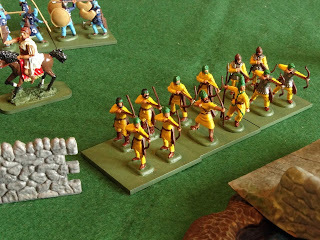 A close up of the Imperial Archers. 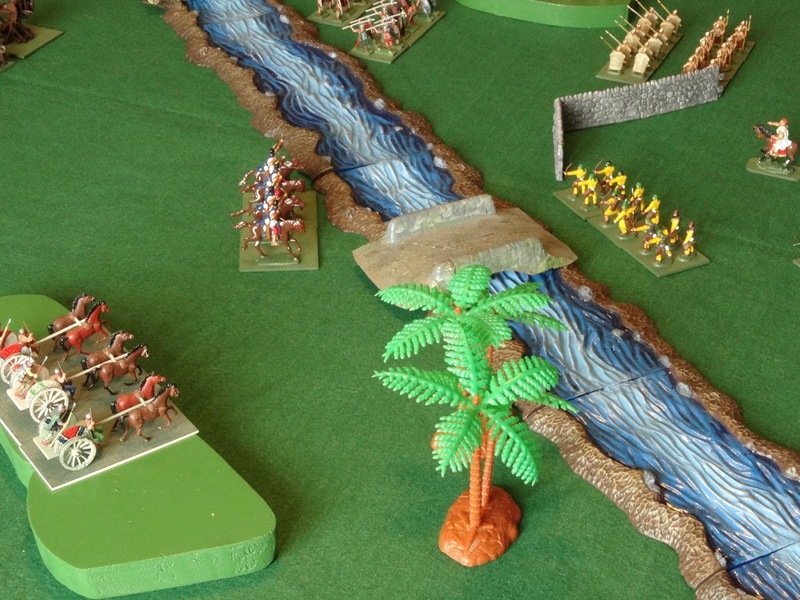 Lovely, I remember playing the battle 30 years ago.
" Sounds good to me..." Me too! Ross, thanks for the link! 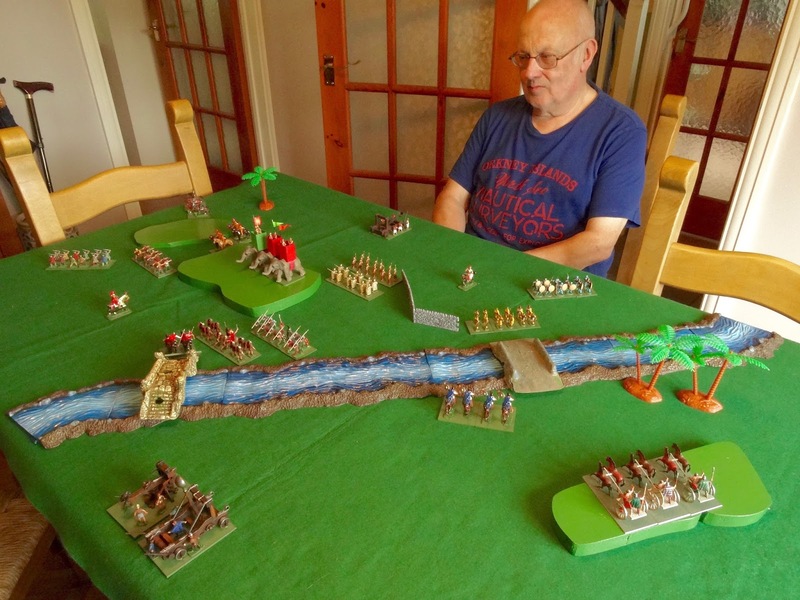 Wonderful to see this sort of gaming. Hope to see more and perhaps your new rules?